ONI Bureau: Good Morning Readers! Here are the Morning News Bulletin on Odisha, India and World by Odisha News Insight. — Dense foggy condition continue in Odisha; 12 districts alerted. — Bangkok-Bhubaneswar Flight passengers stranded in Kolkata. — Cashier of Andhra Bank beaten to death by unidentified persons in Ganjam. — 250 endangered baby sharks seized near Gahiramatha Marine Sanctuary in Kendrapara, 7 arrested. — Kendrapara: 5 critical in road mishap near Jantilo chhak on Cuttack-Chandbali road due to dense fog. — Cuttack: 6 critical after car collides with road divider near Bainchua in Tangi. — Darshan of deities at Puri Srimandir to be restricted from 4.30 pm to 8.30 pm today due to ‘Banakalagi’ ritual of Lord Jagannath. — Another minor girl delivers baby at Tumudibandha area in Kandhamal district; newborn dies. — Food Commission reveals 2 lakh ghost PDS beneficiaries in Odisha. — Odisha Govt to set up additional 102 digital dispensaries. 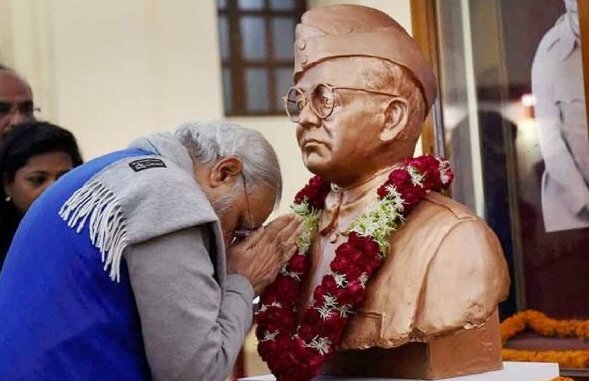 — PM Modi inaugurates Netaji Subhash Chandra Bose museum at Red Fort in Delhi today. — Coast Guard of India and Japan today kicked off disaster control and search and rescue exercises off the coast of Yokohama in Japan. — 2002 Naroda Patiya case: Supreme Court grants bail to four convicts – Umeshbhai Bharwad, Rajkumar, Harshad and Prakashbhai Rathod. — Veteran actor & BJP MP Hema Malini performing at the ‘Pravasi Bharatiya Diwas’ in Varanasi. — Delhi: 21 trains are running late due to foggy weather conditions/low visibility. — Maharashtra: Artist puts up a portrait of Balasaheb Thackeray in front of Shiv Sena Bhavan, Mumbai on the occasion of his birth anniversary. — Delhi: Aparna Kumar, DIG, ITBP becomes the first woman IPS officer to reach South Pole. — NZvsIND First ODI in Napier: New Zealand bowled out for 157 in 38 overs. — Serena Williams knocked out of Australian Open after losing quarter-final to Karolina Pliskova.